A number of jewels once belonging to the late Dame Elizabeth Taylor were exhibited at Christie's London last month, in a prelude to the upcoming sale set to place in New York City. Aptly labelled by the auction house as 'The Crown Jewels of Hollywood', it is poised, the year being only 2011 notwithstanding, to be the jewellery sale of the century. Elizabeth Rosemond Taylor was born in Hampstead, London in 1932, the daughter of two Americans of artistic disposition, her father an art dealer, her mother an actress. She is quoted as saying, 'My mother says I didn't open my eyes for eight days after I was born, but when I did, the first thing I saw was an engagement ring. I was hooked." And so she was, on both jewellery and matrimony. 'Liz', as she apparently did not like to be called, vies for the title of greatest jewellery collector of her day, a testament to which is the fact that two important diamonds bear her name. She received rare and important jewels from her string of famous husbands (of which there were seven), as well as purchasing on her own account, being the utmost connoisseuse. The first diamond named for the star will be sold by Christie's---the Elizabeth Taylor diamond. Originally known as the Krupp diamond, it was given to her by once-and-again husband, the famed actor Richard Burton, in 1968. 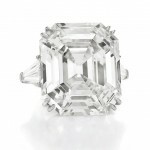 It is a 33.19 carat Asscher cut diamond set in a platinum ring, flanked by tapered baguettes, and is conservatively estimated to fetch between 2.5 to 3.5 million US dollars. Though most would assume that a diamond of that magnitude could not be topped, in the very next year Burton gifted his wife with what is now known as the Taylor-Burton diamond. The pear shaped diamond was cut by the premier American jeweller, Harry Winston, with a final weight of 69.42 carats, and was set into a necklace by Cartier. It is said that Ms Taylor would casually toss the diamond necklace into her jewel box, which resulted in a chipproving that diamonds are not indestructible, despite the common misconception. Not a part of the sale, today the Taylor-Burton diamond is now owned by Robert Mouawad, and after being recut to remove the chip, weighs and even 68.00 carats. Another famous diamond in the exhibition, yet another gift from Burton, is the 'Taj Mahal' diamond, set in a Mughal style necklace. This historic diamond, believed to have been cut circa 1628, was once owned by Shah Jahan, who commissioned the famed buildingitself a temple to love---for which it bears the name. Not only of rare provenance, its cut and decoration are unusual---a flat, heart-shaped diamond inscribed with the words 'Love is Everlasting' in Arabic script. Not without variety, perhaps the world's most famous pearlLa Peregrinais also part of this epic sale. Meaning 'The Wanderer' in Spanish, this pear-shaped 55.95 carat pearl is believed to have been found in the Gulf of Panama in the mid-sixteenth century, and as a part of the Spanish colonies at the time, was given to then king, Phillip II of Spain. It is said to have been worn my Queen Mary I of England, his wife, and appears in various European royal portraits, including one by Velasquez. It was subsequently in the possession of other illustrious persons, including Napoleon III, before finally ending up in the collection of Elizabeth Taylor. This is just a small selection of the fabulous jewellery of Ms Taylor. The exhibition will continue at various locations around the world, before being sold in New York City on the thirteenth of December.